Lipopeptides are a promising group of surface-active compounds of microbial origin (biosurfactants). These diverse molecules are produced mainly by Bacillus and Pseudomonas strains. Because of their attractive physiochemical and biological properties, biosurfactants are considered to be “green and versatile molecules of the future”. The main obstacles in widespread use of biosurfactants are mainly their low yields and high production costs. Pseudofactin (PF) is a lipopeptide produced by Pseudomonas fluorescens BD5. Recently, we identified two analogues, PF1 (C16-Val) and PF2 (C16-Leu), and reported that PF2 has good emulsification and foaming activities, as well as antibacterial, antifungal, anticancer, and antiadhesive properties. Reported production of PF in a mineral salt medium was approximately 10 mg/L. Here, we report successful high-throughput optimization of culture medium and conditions for efficient PF production using P. fluorescens BD5. Compared with production in minimal medium, PF yield increased almost 120-fold, up to 1187 ± 13.0 mg/L. Using Plackett–Burman and central composite design methodologies we identified critical factors that are important for efficient PF production, mainly high glycerol concentration, supplementation with amino acids (leucine or valine) and complex additives (e.g. tryptone), as well as high culture aeration. We also detected the shift in a ratio of produced PF analogues in response to supplementation with different amino acids. Leucine strongly induces PF2 production, while valine addition supports PF1 production. We also reported the identification of two new PF analogues: PF3 (C18-Val) and PF4 (C18-Leu). Identification of critical culture parameters that are important for lipopeptide production and their high yields can result in reduction of the production costs of these molecules. This may lead to the industrial-scale production of biosurfactants and their widespread use. Moreover, we produced new lipopeptide pure analogues that can be used to investigate the relationship between the structure and biological activity of lipopeptides. Biosurfactants (BS), a broad group of surface-active molecules, are secondary metabolites of microbial origin and they may have a variety of applications in industry, healthcare, or farming in the near future. Among the different classes of BS (e.g. glycolipids, lipopolysaccharides, phospholipids), lipopeptides (LPs) seem to be a particularly promising because of their compelling properties and high diversity. LPs can act as antibiotics, antiadhesives, antitumor compounds, cleaning, and foaming agents, but their action on living cells is not always clear. Potential applications of BS have been studied extensively and is the subject of many reviews and research publications [1–6]. Many bacterial and fungal species produce LPs. However, most of the published research on microbial LPs is performed using Bacillus sp. and Pseudomonas sp. [7–9]. To date, among bacterial LPs, only surfactin can be produced on a larger scale because of a long and successful process of optimization research, making its price more affordable [10, 11]. Other LP biosurfactants types such as iturin, fengycin, lichenysin, and mycosubtilin are still undergoing production optimization and scale-up outcome [5, 12–14]. Similarly, there are only a few commercially available high-purity LP standards, mainly surfactin from Bacillus subtilis, which is supplied by a few companies around the world. Besides surfactin, other LPs such as fengycin, iturin, lichenysin, and mycosubtilin are available. The least expensive is surfactin, with “industry-friendly” prices of approximately 300–500 €/kg, while others are much more expensive. This reflects the productivity and other difficulties of industrial-scale methods for the production and purification of LPs. Quality of such LPs will vary and may affect the range of potential applications, but in our opinion, these prices have already allowed the substantial growth of LP biosurfactant use in the pharmaceutical and food industries. Although most efforts have been placed into research and commercialization of LPs of Bacillus origin, Pseudomonas sp. also produce a high diversity of LP families. According to the Norine database , there 365 peptides grouped into 39 families identified in the Pseudomonas genus. Unfortunately, no commercial Pseudomonas-origin LP standards are available. In contrast to Pseudomonas sp. LPs, different optimization and scaling-up approaches focused on Pseudomonas rhamnolipids , achieving industrially viable yields as high as 5 g/L , showing the potential of Pseudomonas sp. to produce valuable surface active compounds. Therefore, studies on optimizing production of LPs of Pseudomonas origin are of the great importance. Pseudofactin (PF) is a LP that is produced by Pseudomonas fluorescens BD5 isolated from an Arctic Archipelago Svalbard . Previously, two analogues of PF were identified: PF1 (C16-Gly-Ser-Thr-Leu-Leu-Ser-Leu-Val) and PF2 (C16-Gly-Ser-Thr-Leu-Leu-Ser-Leu-Leu). The only difference between these analogues is the amino acid in the eighth position. The PF peptide moiety is cyclized by the lactone bond between threonine and the eighth amino acid. PF exhibits antimicrobial [18, 19], antiadhesive [18, 20], and antibiofilm  activities against several pathogenic bacteria and yeast such as Candida albicans. PF antitumor activity has also been investigated . Moreover, PF has better emulsifying properties compared to Tween 20 or Triton X-100 . To date, only the properties of PF2 have been investigated . P. fluorescens BD5, when cultivated in mineral salt medium (MSM), is capable of producing low amounts (< 10 mg/L) of PF, and it mainly produces PF2 . Because of these low yields, it is currently impossible to test the industrial or pharmaceutical potential of PF. Therefore, PF production should be further optimized to provide affordable material for research. While optimization of LP production has been undertaken by many laboratories around the globe, another direction in LP research is uncovering the LP structure–function relationship [22, 23]. To the best of our knowledge, all LPs are produced by microbes as mixtures of structural analogs that differ in length and/or branching of the hydrophobic chain as well as substitutions within the amino acid “head” of the molecules. For example, B. subtilis strains are capable of producing up to 12 surfactin analogs and P. fluorescens SS101 produces eight or more massetolide A isoforms [1, 5]. Even different LP families can be produced by one strain, as shown for different B. subtilis and B. amyloliquefaciens (velezensis) strains that produce several iturin, fengycin, and surfactin analogs [13, 24]. Proportions of LP analogs differ among bacterial strains and it can change in response to certain conditions, e.g. supplementation with different amino acids or carbon sources. This effect was probably best studied for Bacillus. For example, Liu et al. showed that supplementation of culture medium with particular amino acids brings out production of surfactins with specified fatty acids. In this study Arg, Gln, or Val supplementation increased the amount of surfactin variants with even β-hydroxy fatty acids, while supplementation with Cys, His, Ile, Leu, Met, Ser, or Thr increased amount of surfactin variants with odd β-hydroxy fatty acids. Functions of different analogs have been poorly studied, but even a minor modification in the molecular structure can result in an extensive change in physiochemical properties [26, 27]. However, there are only few reports on identification of functions, properties, or possible applications of different LP analogues [26, 28, 29]. Structural analogues of a certain LP molecule can be used to study the relationship between their structure and biological activity. Such knowledge will improve the understanding of natural functions of LPs and will be also helpful in finding new applications for LPs or tailoring new molecules with a specific activity. The aim of this work was to enhance the yield and study the variety of LPs produced by P. fluorescens BD5. We report successful high-throughput optimization of medium components and culture conditions for the efficient production of PF, using design of experiment (DoE) methodology, mainly Plackett–Burman and central composite design (CCD) models for planning the experiments. Moreover, we identified new PF isoforms (PF3 and PF4) in optimized cultures. We also reported a shift in the ratio of produced PF1 and PF2, in response to supplementation with different amino acids. According to our knowledge, no such a complex research has been performed for LPs of Pseudomonas origin. Optimization of BS production requires a holistic approach that usually starts with a screening of efficient BS-producing strains (and/or strain engineering to produce BS effectively), followed by the finding the optimal bioprocess parameters (such as cultivation medium, temperature, oxygenation, and fermentation mode) and downstream processing (recovery and purification molecule of interest) [23, 30, 31]. In our work, we focused on the optimizing medium composition and culture conditions to maximize PF production, which is a LP produced by P. fluorescens BD5. We divided the optimization of PF production into three main stages. During the first stage, “Initial medium screening”, we tested 11 different media in standard Erlenmeyer shaken flasks to select the most promising medium to be further optimized. During the second stage, “High-throughput culture optimization”, we used the Biolector® microfermentation system. This system allowed us to grow all cultures in high-throughput mode. In the Biolector®, we optimized medium that was previously selected during the “Initial medium screening”. We tested different additives to this medium (e.g. amino acids, nitrogen, or carbon sources) on bacterial growth and PF production. We also performed DoE-based experiments in the Biolector® to identify the most significant factors influencing PF production. DoE methodology allowed us to establish a new medium with optimal levels of these significant factors. In the last stage, “Verification of optimized culture and further culture optimization”, we tested the optimal medium in different shaken Erlenmeyer flasks to investigate the influence of culture oxygenation and initial glycerol concentration on the bacterial growth and PF production. Moreover, we proposed a method for the production of specific PF structural analogues and identified new PF analogues. Different minimal media (e.g. MSM) are traditionally used to screen BS producers and to produce BS, using glucose or hydrocarbons as the sole carbon sources . Also first protocols for the production of PF by P. fluorescens BD5 included stationary cultivation in MSM (supplemented with glucose) for 7 days, followed by clarification of cultures, extraction with ethyl acetate, and separation by RP-HPLC . The method was simple, but time-consuming and inefficient. PF production under conditions mentioned above was estimated to be < 10 mg/L (data not shown) and required further optimization for the efficient PF production. During the initial screening we tested 11 different media (Table 6 and “Culture media” section). Some of these media were previously proposed and tested by other authors for the production of BS [23, 32–35] or the media were modified by us. Results are summarized in Table 1. PF yield obtained in MSM media was low, reaching a maximum of 20.9 ± 0.5 mg/L in MSM +G+LB medium. Additionally, in LB and LA media, PFC reached only about 20 mg/L. We observed lower PF production in medium supplemented with glucose compared to medium containing glycerol (Table 1, P < 0.05). Low PF production in shaken cultures with glucose as a main carbon source can likely be explained by the low cell density in the cultures and by precipitation of LP at low pH and/or inhibition of LP production at low pH levels [6, 36]. With glucose as the carbon source, pH of the cultures decreased during the experiments, reaching 4.0–4.2 after the third culture day. In comparison, when glycerol was used (e.g. in MSM +G or LA +G), smaller changes in pH were observed (Table 1). The enrichment of minimal medium with complex additives (e.g. yeast extract or LB medium) caused higher PF production (Table 1, P < 0.05). Similar observations were reported earlier . Supplementation of cultivation medium with hydrocarbons to produce BS is often mentioned for Pseudomonas, especially for rhamnolipid production [6, 38]. Therefore, we tested if addition of hexadecane or rapeseed oil will result in more efficient PF production. P. fluorescens BD5 is able to grow using hydrocarbons as a carbon source, but the PF yield drops to less than 5 mg/L (Table 1). A modified LA medium, which is widely used to produce LP using Bacillus is a complex medium, enriched with growth-promoting yeast extract as well as LP production-promoting Glu. Modifying the traditional LA medium caused an increase in LP production by B. subtilis [33, 39]. Glucose is a main carbon source in LA medium (Table 6), and also in this case we observed a pH decrease in P. fluorescens BD5 cultures. Substitution of glucose with glycerol in LA +G medium resulted not only in maintaining more stable pH levels, but also in slightly better growth and in an almost threefold increase in PF yield (Table 1, P < 0.005). The beneficial effect of glycerol on surfactin production by B. amyloliquefaciens (velezensis) was recently demonstrated . This suggests a positive role of glycerol, amino acids, and complex additives (yeast extract and/or peptone) in promoting growth and PF production by strain BD5. Pseudomonas fluorescens BD5 was able to produce more PF (~ 80 mg/L), only when cultivated in KB medium (Table 1). KB medium was previously used to produce LP using Pseudomonas . During culture in KB medium, we observed only minor changes in pH, the highest growth (maximum 12.57 ± 0.09 g/L DCW) the highest PFC (80.8 ± 0.8 mg/L) and YP/X (7.75 ± 0.25 mg/g) among all tested media. To test whether the culture oxygenation level may affect PF production, we additionally compared cultures in shaken flasks filled differently with media. We tested 20% (Table 1) and 40% filling volume (data not shown) and observed 10–20% higher growth and 10–50% higher PF yield (data not shown, P < 0.05) in cultures with a higher oxygenation level (lower filling volume). To compare different oxygenation levels, we calculated the theoretical OTR values in the cultures in Erlenmeyer flasks using equations proposed previously [41, 42]. OTR in the better oxygenated cultures (20% filling volume) was 41.7 mmol/L/h, whereas for 40% filling volume the OTR was approximately 1.8-times lower (23.5 mmol/L/h). Initial screening results showed that, among tested media, KB was the best for the production of PF by P. fluorescens BD5. Moreover, culture oxygenation has a positive effect for both, microbial growth and PF production. Observed PF yield (in KB medium, 20% filling volume) increased approximately eightfold compared to cultures in MSM (Table 1). Over the years, various supplements have been tested to improve LP production by bacteria and yeast. Generally, different carbon and/or nitrogen sources seem to be the most important and have been tested extensively . Traditionally, these experiments are performed in various shaken flasks, which is not efficient. To perform these experiments in a high-throughput manner, we used the Biolector® microfermentation system. The Biolector® system was previously used to investigate the production of rhamnolipids  and LPs [33, 44]. During the initial experiments in the Biolector®, we tested the influence of different KB and KB-M1 media variants (Table 6 and “Culture media” section) and culture aeration on the growth and PF production by P. fluorescens BD5. The results are shown in Table 2. During the first medium screening in the Biolector®, when P. fluorescens BD5 was cultured in KB medium, we observed that the maximal DCW was approximately 2.2–2.4-times lower and the maximal PFC was approximately 2.4–2.8-times lower compared to cultures in Erlenmeyer flasks (see “Initial media screening” section). However, YP/X values for both cultures were similar (Tables 1 and 2). The OTR reached in Erlenmeyer flasks was 41.7 mmol/L/h, while in the Biolector®, the maximal OTR of 30 mmol/L/h was tested, which can explain observed differences in DCW and PFC. The KB-M1 medium (Table 6) was design to test the effect of various additives for the growth and PF production by strain BD5 in the initial screening using the Biolector®. In this experiment, we tested the addition of nitrogen sources [amino acids: Leu, Glu, amino acid mixture, and (NH4)2SO4] as well as citrate and succinate as the sole carbon sources. We also investigated the impact of culture oxygenation. Our results suggest that for tested OTRs (30 and 15 mmol/L/h), there are no significant differences in the DCW (P > 0.120), but we were able to detect significantly larger amounts of PF in better oxygenated cultures (P < 0.05). Moreover, the addition of Leu has a strong positive effect on both, overall PF yield and specific PF productivity. The addition of 5 g/L Leu to KB-M1 medium caused a 2.6-fold increase in PFC (P < 0.001) and 2.5-fold increase in YP/X (P < 0.001) with no influence on bacterial growth, compared to KB-M1 without Leu (Table 2). The positive influence of Leu on the production of LP production was previously shown for surfactin produced by B. subtilis . Additionally, Glu may be another amino acid that has a positive effect on LP production [45, 46]. For P. fluorescens BD5, we detected no influence of Glu on bacterial growth and PF yield, but the YP/X slightly increased (P < 0.05) compared to the culture using KB-M1. We also tested the addition of an amino acid mixture (Leu, Ser, Thr and Gly), which was equivalent to the molar ratio of amino acids in the PF molecule (see “Culture media”), to produce PF. We detected a 1.3- to 1.5-fold increase in the PF yield (P < 0.01) as well as a 1.6- to 1.8-fold increase in YP/X (P < 0.05). This effect can likely be explained by the presence of Leu only. Addition of ammonium sulfate, which is commonly used as a nitrogen source for the production of BS  reduced PF production. Using citrate or succinate as a carbon source instead of glycerol also reduced growth and PF production (Table 2). Similarly to Leu addition, complex additives seem to have a crucial impact on LP production. It was previously shown that culturing bacteria using different complex media affects the yield of LP and microbial growth . Therefore, in the second round of Biolector® screening, we tested six complex nitrogen additives (peptone, tryptone, proteose peptone, casitone, yeast extract, and soy peptone) to investigate their influence on bacterial growth, PFC, and YP/X. The results are shown in Table 3. KB-M1 medium was further modified, which resulted in KB-M2 medium with higher glycerol and complex additive concentrations, as well as Leu addition (Table 6). Use of KB-M2 medium resulted in an intense microbial growth and increased the PF yield (Tables 2 and 3). During this Biolector® run, we also used higher OTRs (50 mmol/L/h) for the better culture oxygenation. The PF yield was high (> 300 mg/L) when five of the six of tested complex additives (peptone, proteose peptone, yeast extract, tryptone, and soy peptone) were used (Table 3). After 48 h of culture, PF yields were comparable for these additives (data not shown), and therefore we extended cultivation time to 66 h to detect possible differences. Our results showed the importance of complex additives on DCW, PFC, and YP/X. The observed maximal DCW values varied from approximately 6 g/L (proteose peptone) to approximately 22 g/L (yeast extract) and the maximal PF yield varied from approximately 80 mg/L (soy peptone) to approximately 630 mg/L (tryptone). The calculated maximal YP/X was the lowest in cultures containing soy peptone (approximately 4 mg/g) and highest (approximately 55–57.5 mg/g) in cultures containing peptone, proteose peptone, and tryptone (Table 3). The PF yield in KB-M2 +tryptone compared to MSM increased over 60-fold (Tables 1 and 3), and almost 20-fold compared to KB (Tables 2 and 3). We assumed that tryptone was the best complex additive for the PF production by P. fluorescens BD5. DoE methodology is a powerful tool that can be used in bioprocess design and optimization. Different DoE approaches have been used to solve the complexity of BS production [10, 11, 33, 35, 48]. Therefore, we used a DoE strategy to further investigate the component concentration based on the previously defined media composition KB-M2 and also the effect of the aeration rate to efficiently produce PF by P. fluorescens BD5. The first model we implemented was 28 × 3/6 Plackett–Burman screening. During these experiments, we tested the influence of eight factors (Table 4) on two responses (PFC and YP/X). Each factor was tested at one of three levels: low (−), medium (0), or high (+). The experimental design, factors’ levels, and the results are summarized in Table 4. Both, maximal PFC (610.4 ± 5.9 mg/L) and DCW (23.14 ± 0.26 g/L) were observed in run 12, whereas maximal YP/X (73.2 ± 2.8 mg/g) was observed in run 4. The lowest responses were observed in runs 2, 3, and 13, in which glycerol (except run 3), tryptone, and Leu were at low levels (Table 4). These suggest the importance of glycerol, tryptone, and Leu concentration, and culture oxygenation in PF production. To interpret the data and determine the influence of each of tested factor, the results were fitted to a linear function and analyzed using Statgraphics Centurion software. The standardized effect of each factor on the response was calculated and shown in Fig. 1, whereas detailed ANOVA analysis results are shown in Additional file 1: Table S1. The Plackett–Burman screening design revealed the strong, positive effect of glycerol and Leu on both, PFC and YP/X. Moreover, tryptone had a strong positive effect on PFC, but a negative effect on YP/X. This can be explained by the high growth-promoting activity of tryptone, which reflects on the YP/X values. The same situation was probably observed for Fe2(SO4)3 (Fig. 1 and Table 4). Culture oxygenation also seems to have a positive effect on PFC and YP/X, but for YP/X, the relationship was insignificant (P = 0.156). Other tested variables (MgSO4, K2HPO4, and trace elements) had no significant effect on PF production in the tested conditions. This was surprising because trace elements (mainly Fe2+, Cu2+ and Mn2+ ions) are considered to be strong, positive inducers for BS production by Bacillus and Pseudomonas. However, mentioned effects were usually observed when Fe2+, Cu2+, and Mn2+ were added to minimal media [11, 49–52]. In our case (rich media with high concentrations of complex nutrients), it is likely that no further supplementation with trace elements was required (Fig. 1). Supplementation with another divalent cation (Mg2+) was also shown to be LP-promoting . Additionally, phosphates were shown to enhance LP production . The opposite effect can be observed for PF production, but these effects are not significant (P = 0.138 for PFC and P = 0.154 for YP/X). The significance of the model was investigated using Fisher’s F-test (Additional file 1: Table S1). The r2 values for the model were 0.786 and 0.766 for PFC and YP/X, respectively. The relatively low r2 could be explained by the interactions between variables, but the model shows an acceptable level of fit . The three most significant variables (glycerol, tryptone, and Leu) from the Plackett–Burman screening (Fig. 1) were chosen for further optimization using a CCD design in Biolector®. CCD was used to build a second-order (quadric) model of the impact of variables on the tested responses (PFC and YP/X) and to investigate potential relationships between variables. We used the CCD 23 + star (rotatable and orthogonal) model with 23 runs, including nine centerpoints. Each variable was tested at three levels (low, medium, and high), but two star-points (low and high) were also added. For all experimental runs DCW and PFC were measured and YP/X was calculated. The experimental design, factors’ levels and the results are summarized in Table 5. For maximizing PFC: (A) 67 g/L of glycerol, (B) 12.1 g/L of tryptone, and (C) 9.2 g/L of Leu. This medium was named KB-Opt-CCD (Table 6). For maximizing YP/X: (A) 82 g/L of glycerol, (B) 11.5 g/L of tryptone, and (C) 9.2 g/L of Leu. Maximized predicted PFC and YP/X values were 551.6 mg/L and 30.4 mg/g, respectively, and are lower than the maximal observed responses (640.2 ± 5.2 mg/L and 41.9 ± 0.8 mg/g, cf. Table 5). The significance of the model was investigated using Fisher’s F-test (Additional file 1: Table S2). The r2 shows acceptable values for the model fit of 0.846 and 0.781 for PFC and YP/X, respectively. The model predictions of PFC and YP/X are shown on contour plots (Fig. 2). For the verification of high-throughput optimization and for further optimization of culture conditions and medium components, we performed cultures in KB-Opt +Leu medium in shaken flasks. KB-Opt was derived from KB-Opt-CCD by increasing the concentration of tryptone to 15 g/L and Leu to 10 g/L (Table 6 and “Culture media” section), which simplified media preparation. We detected no significant differences in growth and PF production kinetics for BD5 cultured in KB-Opt and KB-Opt-CCD in shaken flasks when the same glycerol concentration was used (data not shown). 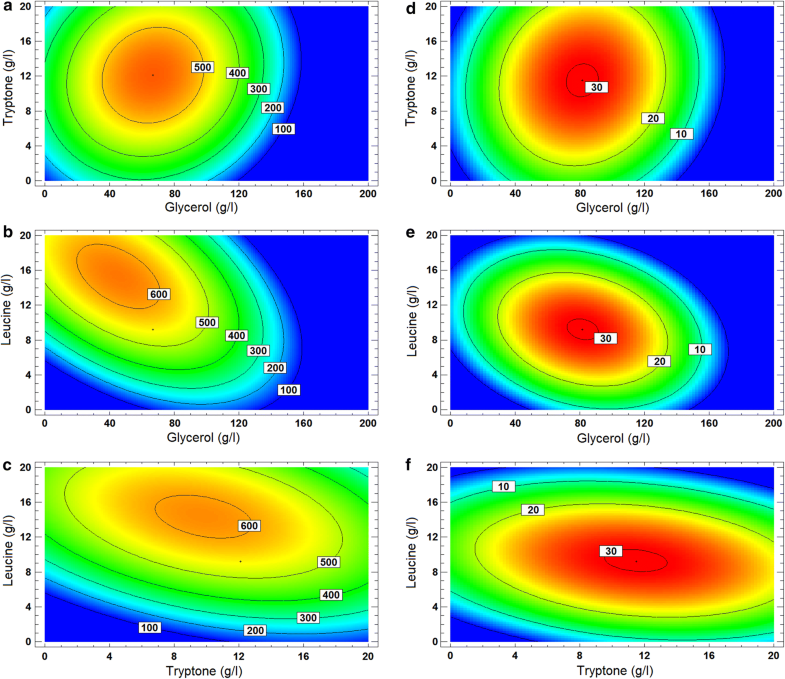 We tested the influence of the initial glycerol concentration (20, 40, 80, and 100 g/L) on growth and PF production in 300-mL Erlenmeyer flasks (20% filling volume) and 500-mL baffled flasks (20% filling volume). This resulted in different oxygenation of the cultures and carbon/nitrogen ratios. The growth curves and PF production kinetics are shown in Fig. 3. The oxygenation of the cultures seems to have critical impact on both, cell growth and PF production. For P. fluorescens cultured in 300-mL Erlenmeyer flasks, the growth rate was similar independently from initial glycerol concentration (0.153–0.168 g/h between 0 and 72 h of cultures). Additionally, no logarithmic growth phase was observed (Fig. 3a). Maximal PFC in the Erlenmeyer flasks ranged from 86.1 ± 7.0 mg/L (20 g/L glycerol) to 194.1 ± 7.0 mg/L (100 g/L glycerol) whereas YP/X from 6.80 ± 0.71 to 14.35 ± 0.11 mg/g. Here, approximately 20-fold increase in PF yield can be observed compared to MSM medium and an approximately 2.5-fold increase compared to KB medium (Table 1 and Fig. 3b). For YP/X, a threefold and 1.8-fold increase was observed compared to MSM and KB media, respectively. The theoretical OTR calculated for these cultures was 47.8 mmol/L/h [41, 42]. In the next step of verification of the optimal media, we tested baffled Erlenmeyer flasks (500 mL, 20% filling volume) to test if the cultures can be better supplied with oxygen. According to Gupta and Rao (2003), calculated KLa values for the cultures in a baffled flask should be approximately doubled in comparison to the cultures performed in the same medium and filling volume using Erlenmeyer flasks without baffles. Therefore, the calculated theoretical OTR for the cultures in baffled Erlenmeyer flasks was estimated to be 81.1 mmol/L/h [41, 42, 54]. The growth rates of these cultures were higher (0.387–0.698 g/h between 0 and 48 h of cultures) and maximal DCW reached almost 40 g/L for the cultures with 80 and 100 g/L glycerol (Fig. 3a). The maximal observed PFC reached 1187.0 ± 13.0 mg/L, when 100 g/L glycerol was used in a baffled flask. Additionally, YP/X was the highest in the described conditions and reached 30.35 ± 0.98 mg/g. Considering the KB-Opt 100 g/L glycerol medium, use of baffled flasks increased DCW 2.6-fold, PFC 5.9-fold, and YP/X 2.3-fold compared to standard Erlenmeyer flasks. This shows the importance of oxygen transfer in bacterial cultures, especially when rich media are used. LPs are usually produced by bacteria as a mixture of analogues. The differences between analogues include length and/or branching of hydrophobic moiety, as well as substitutions in amino acids in a peptide part . It was previously shown that changes in culture conditions and/or medium composition can result in a shift in the relative abundance of LP analogues produced by B. subtilis [45, 55]. To the best of our knowledge, no such influence was shown for Pseudomonas sp. We tested if the supplementation of KB-Opt medium (Table 6) with different amino acids will result in the increase of PF yield or in the shift in relative abundance of PF analogues. Supplementation of KB-Opt medium with 10 g/L Leu (KB-Opt +Leu) resulted in the increased PF2 production (C16-Leu). Here, the relative abundance of analogues was 2.3 ± 0.6% PF1 and 97.7 ± 4.7% PF2, with the total PFC of 1173.3 ± 23.9 mg/L (Fig. 4b), while for KB-Opt medium supplemented with 10 g/L Val (KB-Opt +Val), production of PF1 (C16-Val) emerged. Relative abundance of PF analogues was 53.0 ± 3.3% PF1 and 47.0 ± 0.2% PF2, with the total PFC 1114.1 ± 17.4 mg/L (Fig. 4a). HPLC chromatograms of KB-Opt (supplemented with Val or Leu) cell-free supernatants are shown in Fig. 4. During the experiments, as the total PF yield increased, we identified trace quantities of new PF analogues. These newly identified compounds were called PF3 (C18-Val) and PF4 (C18-Leu) and the production of these analogues by strain BD5 emerged using KB-Opt-Leu or KB-Opt-Val media (Table 6) and a longer incubation time (up to 7 days). PF3 and PF4 were identified in SPE extracts of cell-free supernatants from P. fluorescens BD5 cultures (Fig. 5), and they were analyzed using UPLC-MS/MS, as described before . The 1053 and 1067 [H+] m/z adducts were assigned to the newly identified peaks. The 1053 and 1067 m/z ions were used as the precursor ions for TOF–MS/MS (Time of flight MS/MS) analyses of PF3 and PF4, respectively. PF1 and PF2 TOF–MS/MS data and sequence elucidation were used for comparison . TOF–MS/MS data and proposed structures of PF3 and PF4 are shown in Fig. 6. We measured PF analogues concentrations during cultivation of P. fluorescens BD5 in KB-Opt-Leu medium (Table 6), using previously established HPLC methods . Under the described conditions, strain BD5 is capable of producing 8.8 ± 0.6 mg/L of PF3 and 20.1 ± 0.7 mg/L of PF4 in a total PFC of 1082.9 ± 24.5 mg/L. PF analogues can be further produced and individually purified using semi-preparative HPLC. Then, physiochemical and biological properties of analogues can be investigated, which may lead to a better understanding of the LP structure–function relationship. Three-step optimization of medium components and culture conditions for the efficient production of a lipopeptide pseudofactin (PF) was performed. Critical factors, substantial for efficient production of PF have been identified, including high glycerol concentration (up to 100 g/L), amino acid (leucine or valine), and complex additive (e.g. tryptone) supplementation as well as high culture aeration. Optimized King’s B medium (KB-Opt) for the efficient production of PF was described. Up to 1200 mg/L of PF can be produced by P. fluorescens BD5, which is almost 120-fold increase compared with the cultures in MSM. The ratio between PF structural analogues produced by P. fluorescens BD5 can be controlled by a simple amino acid supplementation. Supplementation of optimized medium with leucine increases the production of PF2 (C16-Leu), whereas supplementation with valine enhances the production of PF1 (C16-Val). 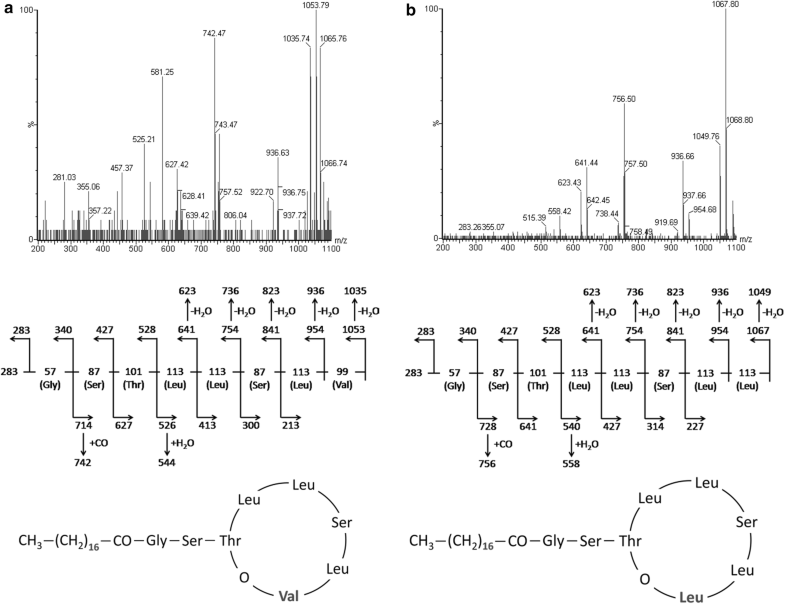 Two new analogues of PF were identified: PF3 (C18-Val) and PF4 (C18-Leu). These analogues were identified in cultures with a high initial glycerol concentration. Chemicals and media components were purchased from manufacturers as follows: yeast extract, proteose peptone, tryptone, casitone (pancreatic digest of casein), and soy peptone, (Becton–Dickinson, USA); peptone (Difco, USA); glucose, K2HPO4, MgSO4, (NH4)2SO4, KCl, NaCl, Fe2(SO4)3, MnSO4, CuSO4, and sodium citrate (POCH, Poland); sodium succinate (Avantor, USA); LB, MOPS, l-leucine (Leu), l-valine (Val), l-glutamic acid (Glu), glycine (Gly), l-serine (Ser), and l-threonine (Thr) (Bioshop, Canada); glycerol (VWR International, USA); hexadecane (Sigma-Aldrich, Germany); and rapeseed oil (ZT Kruszwica S.A., Poland). Various media tested for the production of PF are summarized in Table 6. Before starting the culture, the pH of all media used was set at 7.0 with 6 M NaOH or 6 M HCl. All media were buffered with 100 mM MOPS (3-(N-morpholino)propanesulfonic acid). When stated, media were modified to test the influence of various nitrogen and/or carbon sources on bacterial growth. Basic media compositions are shown in Table 6, whereas various media modifications are described below. During the initial medium screening, four basal media (MSM, LB, KB, and LA) and seven modified basal media were tested (Tables 1 and 6) to choose medium for further optimization experiments. Basal media were modified to investigate the impact of the carbon source and adding nitrogen or trace elements on bacterial growth and PF production. Modifications to the MSM medium (Tables 1 and 6) are as follows: MSM +LB (1/25 v/v LB added), MSM +G (10 g/L glycerol added instead of glucose), MSM +G+LB (10 g/L glycerol added instead of glucose and 1/25 v/v LB added), MSM +T (trace elements added: 2.4 mg/L Fe2(SO4)3, 1.6 mg/L CuSO4, and 0.4 mg/L MnSO4), MSM +H (10 g/L hexadecane added instead of glucose), and MSM +O (10 g/L rapeseed oil added instead of glucose). We also tested the change from glucose to glycerol (10 g/L) in LA medium (which resulted in LA +G medium). KB medium was selected to be further investigated and modified in the Biolector® experiments. During the first round of Biolector® screening, we tested the impact of different nitrogen additives (selected amino acids and (NH4)2SO4) and carbon sources (citric acid and succinic acid) on bacterial growth and PF production. This resulted in KB-M1 medium with the following modifications: +Leu (5 g/L Leu added), +Glu (5 g/L Glu added), +AA mix (5 g/L of a mixture of four amino acids Leu, Ser, Thr, and Gly in molar ratio 4:2:1:1 added), +Am (5 g/L (NH4)2SO4 added), +Leu+Am (2.5 g/L Leu and 2.5 g/L (NH4)2SO4 added), +Glu+Am (2.5 g/L Glu and 2.5 g/L (NH4)2SO4 added), +Cit (10.6 g/L citric acid added instead of glycerol), and +Suc (9.7 g/L succinic acid added instead of glycerol). During the second round of Biolector® screening, we investigated the influence of different complex additives on bacterial growth and PF production. This resulted in KB-M2 medium with the following complex additives (5 g/L): peptone, tryptone, proteose peptone, casitone, yeast extract, or soy peptone. The Plackett–Burman design was used to screen critical factors that are important for PF production. The following eight factors were tested: concentration of seven medium components (A. glycerol, B. tryptone, C. Leu, D. MgSO4, E. Fe2(SO4)3, F. K2HPO4, G. trace elements: MnSO4 and CuSO4), and culture oxygenation (H. OTR). MOPS concentration was maintained at 100 mM. Variable levels and the Plackett–Burman design summary are shown in Table 4. The CCD design was used to optimize the medium composition for maximizing PF yield. Analysis of the Plackett–Burman design allowed us to choose three factors to be further optimized using the CCD model, which were: A. glycerol, B. tryptone, and C. Leu. Concentrations of other medium components were as follows: 0.1 g/L MgSO4, 0.5 g/L K2HPO4, 50 mg/L Fe2(SO4)3, and 100 mM MOPS. The OTR was set at 55 mmol/L/h. Variable levels and the CCD design are shown in Table 5. Analysis of DoE data allowed us to establish the KB-Opt-CCD medium, which was further tested for the production of PF in shaken flasks. The influence of the initial glycerol concentration in KB-Opt medium for the PF production was tested. KB-Opt was derived from KB-Opt-CCD. Initial concentrations of 20, 40, 80, and 100 g/L of glycerol were tested. Leucine (10 g/L) was added to the medium. For the production of PF analogues, the following modifications to the KB-Opt medium were used: +Leu (10 g/L Leu added) or +Val (10 g/L Val added). The arctic isolate P. fluorescens BD5 (PCM B/00115) was used to produce PF . The BD5 strain was preserved as glycerol stock (− 80 °C) in the Department of Biotransformation, Faculty of Biotechnology, University of Wrocław, Poland, and it was grown on LB agar plates at 28 °C. After 48-hours of incubation, single colonies were used to inoculate 10 mL of LB medium. These precultures were grown overnight (18–22 h) at 28 °C with agitation (160 rpm). Next, the bacteria were pelleted (15 min, 10,000g), washed twice with 0.9% NaCl and resuspended in 5 mL of 0.9% NaCl. The OD at 600 nm (OD) was measured, and these suspensions were used to inoculate cultures for PF production. Initial medium screening experiments were performed in 300-mL Erlenmeyer flasks (Schott DURAN), using 20% or 40% filling volumes. Media used for the cultivation of microorganisms are summarized in Table 6 and in “Culture media” section. Cultures were inoculated with an overnight seed culture, to reach the final OD of 0.01, and then incubated at 28 °C with agitation (160 rpm). Every 24 h, samples were aseptically taken to measure biomass (OD) and the PF concentration (“Analytical methods” section). Cultures were incubated for a maximum of 7 days. Each experiment was repeated at least three times and measurements of each variable were performed in triplicate. High-throughput screening of medium components and culture conditions, which are important for PF production, was performed in 48-well flower microplates in the microfermentation systems Biolector® (m2p-labs GmbH, Germany), which is available on the REALCAT platform at the University of Lille (France) and in the Department of Biotransformation, Faculty of Biotechnology, University of Wrocław (Poland). Media used for the cultivation of microorganisms are summarized in “Culture media” section and in Table 6. Cultures were inoculated with an overnight seed culture to the final OD of 0.01, and then stored at 28 °C and agitated. Certain oxygen transfer rates (OTRs) were reached by applying different working volumes (from 800 µL to 2 mL) and agitation speeds as stated by the Biolector® manufacturer . In each experiment, microbial growth (scattered light), pH, and pO2 were monitored in real time, while PF was measured in a few time points for each experiment. Scattered light measurements were calibrated against dry biomass and OD measurements (“Analytical methods” section). Cultures were incubated for a maximum of 48 h. Each experiment was repeated at least three times and measurements of each variable were performed in triplicate. Verification of optimized medium and further culture optimization were performed in various shaken flasks to obtain different aerations of the cultures using 300-mL Erlenmeyer flasks (Schott DURAN, 20% filling volume) and 500-mL baffled Erlenmeyer flasks (Schott DURAN, 20% filling volume). Here, KB-Opt +Leu medium was used (Table 6 and “Culture media” section). Different concentrations of glycerol, ranging from 20 to 100 g/L were tested. Cultures were inoculated with an overnight seed culture, to reach the final OD of 0.1, and then incubated at 28 °C with agitation (180 rpm). Cultures were incubated for a maximum of 5 days. At certain time points, samples were aseptically taken for biomass (OD) and PF concentration analyses (“Analytical methods” section). Each experiment was repeated at least three times and measurements of each variable were performed in triplicate. PF analogues were produced in KB-Opt medium with modifications (Table 6 and “Culture media” section). Cultures were performed in 500-mL baffled Erlenmeyer flasks (Schott DURAN, 20% filling volume). The KB-Opt medium was supplemented with Val (10 g/L) or Leu (10 g/L) for the production of PF1 and PF2, respectively. High glycerol concentration in KB-Opt (up to 100 g/L) and longer incubation time (up to 7 days) were used to increase the PF3 and PF4 yields. Cultures were inoculated with an overnight seed culture, to reach the final OD of 0.1, and then incubated at 28 °C with agitation (180 rpm). At certain time points, samples were aseptically taken for biomass (OD) and PF concentration analyses (“Analytical methods” section). 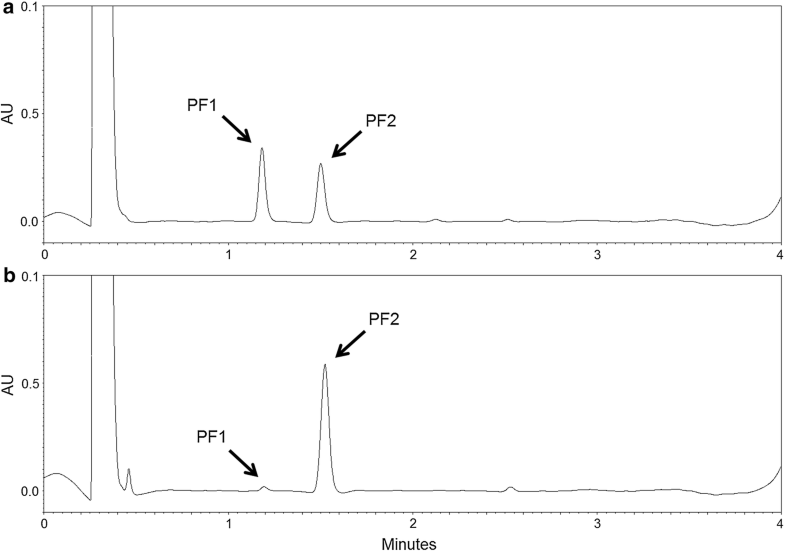 Total PF and single analogue concentrations were measured using RP-HPLC (reversed phase high-performance liquid chromatography). PF analogues were identified using RP-UPLC-MS/MS (reversed phase ultra-performance liquid chromatography mass spectrometry) (“Analytical methods” section). Each experiment was repeated at least three times and measurements of each variable were performed in triplicate. Biomass concentration (dry cell weight, DCW) was evaluated by measuring the optical density (OD) at 600 nm using an Oddyssey DR/2500 spectrophotometer (Hach, USA). OD was correlated with dry biomass measurements (data not shown). When OD measurements were not possible (e.g. because of medium emulsification when rapeseed oil or hexadecane were used as a carbon source), DCW was measured directly using the method proposed by Greenberg . PF concentration (PFC) was measured using HPLC in cell-free culture supernatants, as described previously . Two HPLC systems were used: system 1 consisted of a Beckman Gold 126 Pump and a Knauer Variable Wavelength Monitor equipped with a Macherey–Nagel C18 Isis column (50 mm × 4.6 mm, 1.8 μm) under the control of LP-Chrom software (Lipopharm, Poland). The column was kept at room temperature during analyses. System 2 consisted of Waters Acquity Arc Quaternary Solvent Manager-R, Sample Manager FTN-R and 2489 UV/VIS Detector, equipped with a Waters Cortecs C18 column (50 mm × 4.6 mm, 2.7 µm). The column was maintained at 40 °C during the analyses. Samples were diluted ten times with methanol before analyses. Areas of all detected PF peaks were summed and compared to the PF standard curve, as reported previously . To calculate the specific PF yield (YP/X), the PFC was divided by DCW (data from the same time points). YP/X is expressed as the number of PF in mg produced per 1 g of DCW (mg/g). UPLC-MS/MS analyses of PF analogues were performed using an Waters Acquity UPLC System with a 2996 PDA detector and a Waters Xevo QTof MS System, as described previously . Here, Waters Acquity BEH C18 column (100 mm × 2.1 mm, 1.7 μm) at 40 °C was used. MS analyses were conducted as follows: positive mode ESI; source temperature, 150 °C; desolvation gas temperature, 350 °C; desolvation gas flow, 800 L/h; cone gas flow 20 L/h; cone voltage, 10 V; and capillary voltage 3 kV. The samples were analyzed in the range of 800–1200 m/z. Next, certain parameters were changed and the m/z 1053.79 and 1067.81 ions were used as precursor ions for MS/MS analyses as follows: cone voltage, 40 V; capillary voltage, 3 kV; and collision energy, 40 V. The ions were analyzed in the range of 200–1100 m/z. KLa (volumetric gas–liquid mass transfer coefficient) for the cultures in shaken flasks was calculated using the equation proposed by Fahim et al. . OTR (oxygen transfer rate) in shaken flasks was calculated using the equation proposed by Funke et al. . To calculate OTR values, we assumed, that maximal oxygen solubility in culture medium is 0.2031 mmol/L . Microsoft Excel software was used to analyze the obtained data. Means, standard deviations (SD), and relative standard deviations (RSD) were calculated. Statgraphics Centurion XVII (Statpoints Technologies Inc., USA) was used for designing Plackett–Burman and Central Composite Design (CCD) experiments, as well as for data analysis. Statistical analyses were also performed with Microsoft Excel software using a paired t-test with Bonferroni correction. P values of < 0.05 were considered significant. PB designed the study, performed the experiments, analyzed data, wrote the manuscript and provided founding. FC and FG contributed to the study design and writing the manuscript. FC has coordinated the founding support to perform the experiments at the University of Lille. MŁ provided laboratory equipment, ingredients, and consumables at the University of Wrocław, as well as contributed to designing the study and writing the manuscript. All authors read and approved the final manuscript. We thank the Department of Genetic Biochemistry, Faculty of Biotechnology, University of Wroclaw (Poland) for allowing us to use the Waters Acquity UPLC-MS/MS. We acknowledge the REALCAT platform, which benefits from a state subsidy administrated by the French National Research Agency (ANR) within the frame of the “Future Investments” program (PIA), with the contractual reference “ANR-11-EQPX-0037”. The European Union, through the ERDF funding administered by the Hauts-de-France Region, has co-financed the platform. Centrale Lille, the CNRS, and University of Lille 1 as well as the Centrale Initiatives Foundation, are thanked for their financial contributions to the acquisition and implementation of the equipment of the REALCAT platform. All data generated or analyzed during this study are included in this published article and supporting information. This work was supported by the National Science Centre, Poland, grants 2016/20/T/NZ1/00536 and 2016/21/N/NZ1/02829, and by The Leading National Research Center (KNOW) program of the Wroclaw Center of Biotechnology for the years 2014–2018. This work has been carried out in the framework of ALIBIOTECH project which is financed by European Union, French State and the French Region of Hauts-de-France. We thank the ERASMUS program KA-1 2014-2020 for founding the internship. 12934_2018_968_MOESM1_ESM.docx Additional file 1: Table S1. Analysis of variance for the influence of tested variables on the responses in the Plackett–Burman screening design in the Biolector®. Table S2. Estimated effects on tested variables and analysis of variance for the cubic CCD model on PF yield (PFC) and PF specific production (YP/X). m2p-labs GmbH. Flower plate product data sheet. 2018. http://www.m2p-labs.com/fileadmin/redakteur/Data_sheets/Microtiter_plates/Date_Flower_Plate.pdf. Accessed 15 Jan 2018.